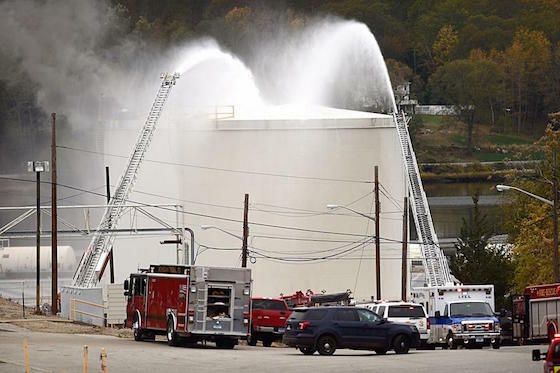 Firefighters pour water on a chemical tank at the Americas Styrenics plant in Gales Ferry, CT. Firefighters battled a blaze Wednesday in a tank at Americas Styrenics (AmSty) in Ledyard, CT. The call for the fire came in at 2:22 p.m. The facility is on the same property as Dow Chemical and Trinseo plants. The fire occurred in an out-of-service storage tank, AmSty spokesman Josh Want said. Other nearby structures on the property had been soaked with water to prevent the fire from spreading. He said the fire had been extinguished and there were no injuries. “We are grateful to have the support of our local fire departments and emergency management personnel,” Want said. About 1,000 pounds of plastic material burned, according to a Facebook post by Ledyard police. DEEP officials were on hand monitoring air, water and ground samples, Mayor Fred Allyn III said on his Facebook page. “The small amount of liquid in the tank is burning and the goal is to allow it to burn itself out,” he said. The Gales Ferry Volunteer Fire Company and vehicles from multiple mutual aid departments, as well as Eversource trucks, were on scene. People were being advised to avoid the area.